My parents are celebrating their 30th anniversary (a few years late!) in Ireland. One of their first stops was the Guinness Storehouse in Dublin, where my Mom, who’s not much of a beer drinker, enjoyed her first pint of fresh Guinness. This made me nostalgic for the first time I sampled Guinness in its ‘homeland.’ I originally published the post below in 2009 on Bangers ‘n Mash, my blog about teaching and traveling in London, UK. Since it is my most viewed blog post EVER, I thought I’d republish it here. “Guinness tastes so much better in Ireland,” I had been told before my trip to Dublin. Intrigued as to how a mass produced brand could taste distinctly different in one country, I felt obligated to sample “a few pints” of the famous brew in its homeland. Prior to the trip, I had only tasted Guinness a couple of times, and was not a huge fan. I found the beer bitter and was worried that its heaviness would do damage to my dainty waistline (haha). I had also perceived it to be more of a ‘Dad drink’ so wasn’t inclined to order it at pubs (as weird as that sounds). Thus, I did not expect to enjoy the notorious perfect pint of Guinness that I would be served in Ireland. Today, 35 countries brew Guinness worldwide. However, each brewery must include the famous secret ingredient, a flavoured extract that is still brewed exclusively in Dublin and sent to international breweries so that the flavour of the perfect pint is consistent. 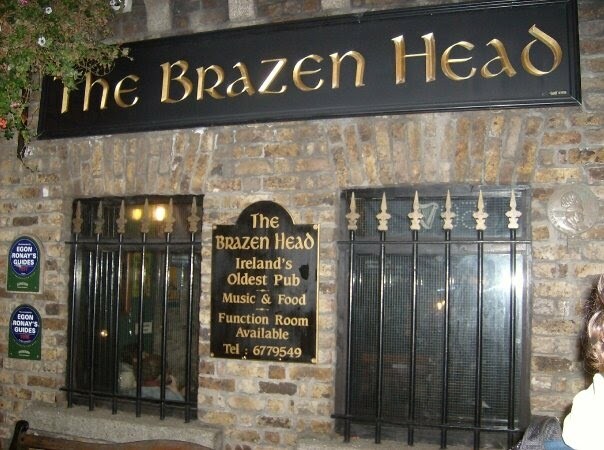 It was the perfect venue to sample the perfect pint: its “medievally, tavern-esque” dark, cozy atmosphere and cobble-stone courtyard create the Irish pub that I’d envisioned. All that was lacking was the music, which was to start in a couple of hours (we went for dinner, the traditional Irish pub food- stew, chowder, fish and chips, so were there a bit early). When I put the ‘liquid gold’ (as Guinness is known due to its flawless flavour and profitability) to my lips, I was surprised at how smooth, creamy, and delicious it was. The thick creamy head is the result of the taps injecting nitrogen gas into the beer as it is being poured. With aftertastes that hinted flavours of rich coffee and dark chocolate, Guinness was not at all the bitter black stuff that I remembered. I am not sure if it was the beverage itself that I was enjoying, or merely the excitement of drinking Guinness in Dublin, but I was hooked. I literally began to crave the beverage’s distinct malty, mocha flavours. Thanks to Lululemon and stretchy denim I was able to put all of my waistline anxieties aside and continue to contribute to Ireland’s economic growth (in truth, at 198 kcal per pint, Guinness actually contains less calories than most non-light beers). The next day, we visited the Guinness Storehouse, where you can go on a self-guided tour of the brewery, learn how to pour the perfect pint, and purchase Guinness merchandise. The tour was really interesting, well-organized, and informative. At the end of the tour, you receive a freshly brewed pint of Guinness. Actually, you have the option of learning how to pour the perfect pint, or enjoying a pint poured for you at the top-floor Gravity Bar, which is walled with windows and offers a 360 degree view of the city. It is worth going on the factory tour simply to see this fantastic view of Dublin. Pat and I opted to enjoy our pints on the top floor, while our friends earned certificates of mastery in Guinness pint pouring. Did you girls remember to update your résumés? The slogan, “It’s alive inside” is used to advertise Guinness. Although this is not literally true, there is something magical about drinking Guinness, especially drinking Guinness at the St. James Gate in Dublin. The pint I had in the Guinness Storehouse was pure perfection. It tasted smoother, creamier, and more delicious than the pint I had at the Brazen Head (and at subsequent pubs…). In terms of its physical composition, I doubt that the beer poured at the St. James Gate is in actuality any different than the beer poured at any other pub in Dublin. However, the allure of drinking Guinness at the Guinness brewery definitely adds to the richness of the experience, and makes you feel like you are consuming an extra special recipe. I thought a lot about what this means. I suppose I would define poetry in an English class as a “written expression of human emotion”. But another interpretation could be that, poetry is, essentially, life. 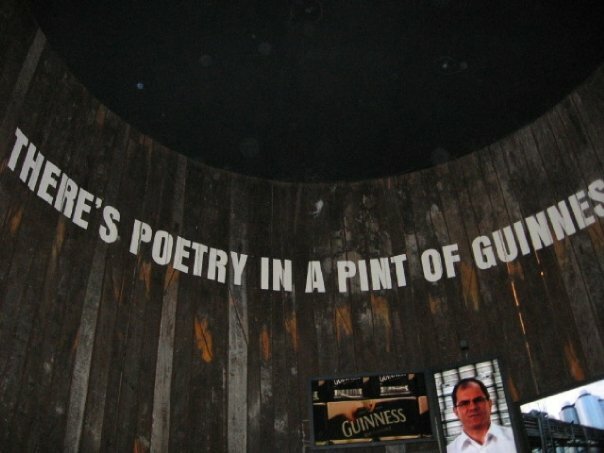 Therefore, the poetry is not the pint of Guinness itself but the life experiences created by the pint: sampling Irish pub food with my brother and friends, discovering that musicians in Irish pubs seem to only play American covers and U2 (I guess I had expected the fiddle?? ), the feeling of panic when I looked in my wallet and realized I had spent more on a night at the pub than on my return flight from London to Dublin (alcohol is ridiculously expensive in Dublin- I literally spent 7 Euros on pints at some pubs), meeting other interesting travellers, and of course, the memory of tasting my first sip of Guinness in Dublin. It is interesting to note that despite the love of Guinness that I developed while I was in Dublin, I haven’t had a drop of it since I got back a couple months ago*. Perhaps this is because I subconsciously know that it just won’t taste as good as it did at the St. James Gate? Although I am sure that I will order the odd pint of Guinness every now and then, I doubt I will ever choose it regularly over other options that I would, of course, drink responsibly. Since my perspective of Guinness consumption in Dublin came from a tourist’s point of view, I am interested in learning more about whether Guinness is actually the drink of preference for most Dubliners, or if that is simply a stereotype. I suppose the commercial success of Guinness suggests that people do, in fact, drink it quite often, but do Irish people link Guinness with part of their cultural identity? Or is its Irishness simply the brand image that Guinness promotes to the world? I’m sure I’ll sample many more pints in the future, but none will have quite the same ‘magic’ as my first Guinness in Dublin! *Since I published this article in 2009, I have consumed many more pints of Guinness. Yet none have been as tasty as that first sip of Irish magic! May 24, 2017 .Reading time less than 1 minute. I’m so honoured to be featured on Shedoesthecity, a Toronto based site that explores anything from bizarre fashion trends to battling the tough stuff. SDTC was interested in learning more about the inspiration behind See What Flowers, my writing process, and what I learned through the writing and research of my novel. I’m an Author on Goodreads! After my début novel, See What Flowers, was published last week, the website Goodreads accepted me as an “author.” Check out my profile here. Goodreads is the world’s largest site for readers and book recommendations. Their mission is to help people find and share books they love. It has 55 Million members and is a great way for authors to connect with readers and for readers to discover books that appeal to their interests. As an author, readers will be able to discuss themes, post reviews, add comments, and ask questions about See What Flowers. They can also highlight, discuss, and comment on quotes from the book as they read. Here are some quotes from See What Flowers that stand out the most to me. But hey, I’m biased…I wrote them! If you’re not on Goodreads, I encourage you to register. It’s free! It’s kind of like an online book club. Also, I encourage you to join the discussion about See What Flowers and add your comments as you read. April 14, 2017 .Reading time less than 1 minute. I’m in the process of self-publishing my first novel and need your help!!! Please take 30 seconds to complete survey below. Thanks Thanks Thanks! Click HERE to complete survey. Have any experience with Amazon CreateSpace? Please leave comments with tips & advice! Thanks Thanks! Bestselling author Glennon Doyle Melton gets up at 4:30am to write. This morning I was going to get up early and go to the gym. I didn’t. After the gym I was going to go to my fave café and get my marking out of the way so that I could spend the afternoon writing. I didn’t. I slept in until after 10am (which rarely happens) & I lay in bed scrolling through Instagram on my phone. Truth is that this is what my body & mind needed this morning. Rest and recovery. So I’m not going to beat myself up over skipping the gym and letting my marking sit in my backpack for a little longer. Glennon’s post struck me this morning because it reveals how important it is to MAKE TIME to pursue our passions. Even bestselling authors like Glennon struggle to prioritize their writing. As a mother of three children, Glennon struggled to find time to write amidst her family responsibilities. So she gets up before her family is awake to make it happen. Even if this means dragging herself out of bed when she wants the extra sleep. Her memoir, Love Warrior, is the product of her getting up at 4:30am so that she could MAKE TIME for writing. As an aspiring writer myself, I’ve been finding myself resenting the various responsibilities that encroach on my time to write. I’m a full-time teacher during the week, so in order to meet professional standards, as well as my own personal standards for myself (which are arguably too high sometimes), I need to spend time in the evening and weekends to get marking done, and prepare my lessons. It is not fair of me to resent my job or even my students because these tasks take time away from writing. Teaching also allows me to pay the bills and contribute to society in a meaningful way. As of now, writing is not paying the bills. So as much as writing fuels my heart, it is not fuelling my very hearty appetite. It is not paying my rent. It is not paying utilities. It is not paying for the splurge on the blue cowboy boots I bought in Arizona. Still, writing fuels my soul and makes me feel happy in a way that nothing else can. Not a person. Not an adventure. Not an experience. It is really hard to explain what writing does for me. I guess it is when I feel most like myself. I love this interview with Joan Didion on CBC’s Writer’s & Company. Before I wrote my first novel, See What Flowers, (which is yet to be published and maybe never will), I had the same attitude as “S”, the aspiring writer Glennon refers to in her Instagram post. I thought “One day when I have enough money, I will write. One day, when I have enough time, I will write. One day, when I am good enough to do it, I will write. One day, when I have a good enough idea, I will write.” But somehow the desire to write overcame the excuses not to and I made the time. Having saved up a lot of money from living in the Arctic and having the privilege to live with family and not pay rent, I took 10 months off of teaching to write. The process of writing a novel that hasn’t been published taught me how important it is for me to make time for writing in my life. Regardless of whether my novel gets published, or regardless of whether or not anyone else thinks my writing is any good…writing adds meaning and value to my life in a way that nothing else can. I also won’t make time for writing if I don’t have FAITH. I need to believe that I am deserving of making time to devote to my craft. Maybe this novel won’t be published. Maybe the next one that is yet to be started won’t be either. But for me, the process of writing is enough to justify making the time to do it, even if this means early mornings, Saturday nights in, and allowing my marking to pile up every now and then. But it doesn’t have to happen all at once either. It will happen bit by bit, by carving out some time each day, and with a lot of faith & sweat. This means setting boundaries on other responsibilities, setting limits on how much I do for other people, and putting myself and my own dreams & desires first sometimes. Why I Feel Lucky to Spend Valentine’s Day Alone. A piece I wrote about the importance of practising self-love on Valentine’s Day is featured on Elephant Journal. Click here to access the article.